Cashouts: 24 hours to 7 business days. 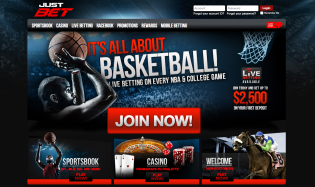 JustBet.cx is an SBR-rated “A” sportsbook online. Licensed out of San Jose, Costa Rica, JustBet services players in 56 countries worldwide and has customer service available 24/7/365. They have been online since 2000, but have roots in the business dating back to the mid-1990’s. After more than a decade of successful business, JustBet was acquired by Bookmaker in 2013, one of the premier online sportsbooks in operation today. They now use Digital Gaming Solutions for their betting software and have a full-service online casino and racebook to fit all your gambling needs. The website layout is very clean and to the point, with all their main sportsbook lines, promotions, live betting and more all available on the top navigation of the site. Your account can be easily accessed via your smartphone or tablet as well. Currently, new players can earn a first-time deposit bonus up to $2,500. 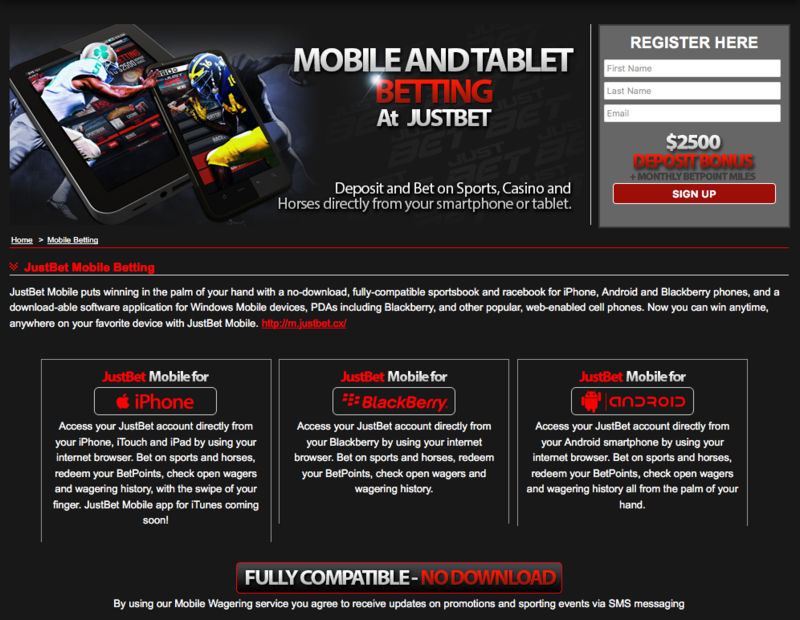 Please continue on for more information about JustBet.cx. Favorable lines pricing for most markets. Payout timeframes normally max out at 7-10 business days. Owned by Bookmaker.eu, one of the most trusted brands in the industry. 15% 1st-time deposit bonus leaves a lot to be desired. Rewards program is lackluster and favors big bettors only. Small reload bonus at just a 10% rate. As of the writing of this analysis, JustBet has only one bonus they currently offer to sports bettors. It’s by no means anything amazing, but the clearance requirements (4x rollover) aren’t as strict either. JustBet.cx offers new players a 15% match bonus up to $2,500 – which breaks down into $500 in free money added to your bankroll if you make the max deposit. This bonus is also available for players looking to play at the online casino they operate. You can play any and all of their games on your desktop or mobile device, however, the rollover on casino play is 40x and the bonus is only 10% up to $2,500 – with of course much stricter requirements on your bonus money. 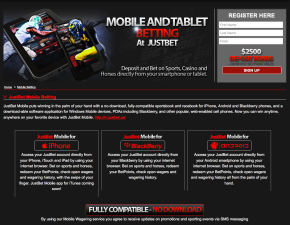 As far as reload bonuses are concerned, JustBet does offer a modest one – albeit very small. Once your first deposit bonus is earned, subsequent reloads will net you a 10% bonus on deposits up to $2,500. It’s very non-competitive compared to other books but at least it’s better than nothing. BetPoints is a loyalty program that offers you valuable BetPoints every time you make wagers. Depending on what you bet, you can even earn daily cash back rebates. There aren’t many books that offer programs like this, which makes it somewhat unique. As you accumulate these BetPoints, you can watch them accrue and redeem them for things like cold hard cash, airline miles, official JustBet.cx merchandise and more. The program is the only solace that JustBet offers to make up for their lackluster bonus offers. Granted, you do have to place a decent amount of wagers to get top tier status, but if done right there’s definitely a good amount of bonus cash you can earn from it. To qualify for the program, you must make an initial deposit of $300 or more. Like many other competitive online sportsbooks, JustBet has no shortage of lines for all major sports leagues (ie NFL, NHL, NBA and MLB) and most every other popular sport imaginable. In all, they feature 15 sports totals on their sportsbook betting page, with soccer taking up most of the action considering the amounts of different leagues set up for each country, like Serie A in Italy, the Premier League in England and UEFA action. Their unique backend allows you to filter which sports you want to bet, as well as gives you an EXACT number of matches/games that JustBet is now taking wagers on. The most popular betting markets for USA players is normally anything centered around football – NFL and NCAA action to be exact. I wouldn’t say the site is focused on action from USA bettors, but they do feature a lot of American-friendly games such as football, basketball, hockey, baseball, golf and tennis on their lines page. JustBet.cx offers competitive pricing for all their sports, with decent dime lines for MLB games. 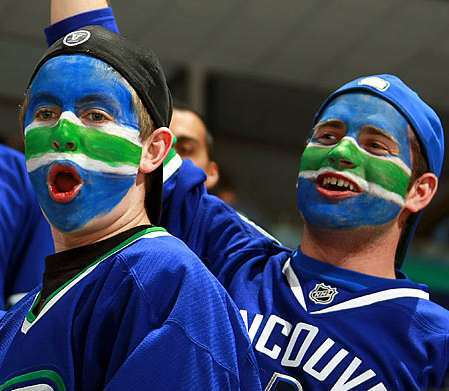 As far as pricing goes for other major sports – aka the “Big 4” – it’s all relatively standard for the industry, with most lines being pretty similar to what you would find at other books, especially for NHL, NBA and NFL betting. As far as locations go outside that of the United States, it’s not difficult to see that the most popular matches to bet seem to lie with international soccer. Throughout the year, you’ll see lines for thousands of games, with access to match betting in dozens of countries throughout Europe, as well as Australia, Japan and Mexico. So if you’re looking to get your soccer fix in, JustBet is definitely the place to bet at. Other major sports that are listed that are favored more towards Euro punters and other international bettors are Euro League basketball, horse racing, Aussie Rules football, rugby and cricket. There are of course similar betting trends on American sports based around the NFL, MLB, NBA and NHL sports leagues as well. 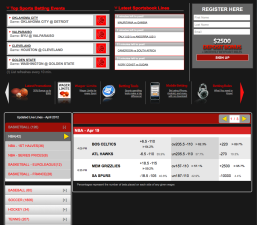 They also offer individual futures and props options on the left sidebar. You simply select your sport and it should have an additional selection towards the bottom for whatever futures bet or prop bet you would like to place a wager on. As far as the overall pricing goes for a majority of the lines for each sport, I wouldn’t grade JustBet.cx particularly high. In fact, most of their lines are either “par for the course” or are simply not as competitive as other online bookies. 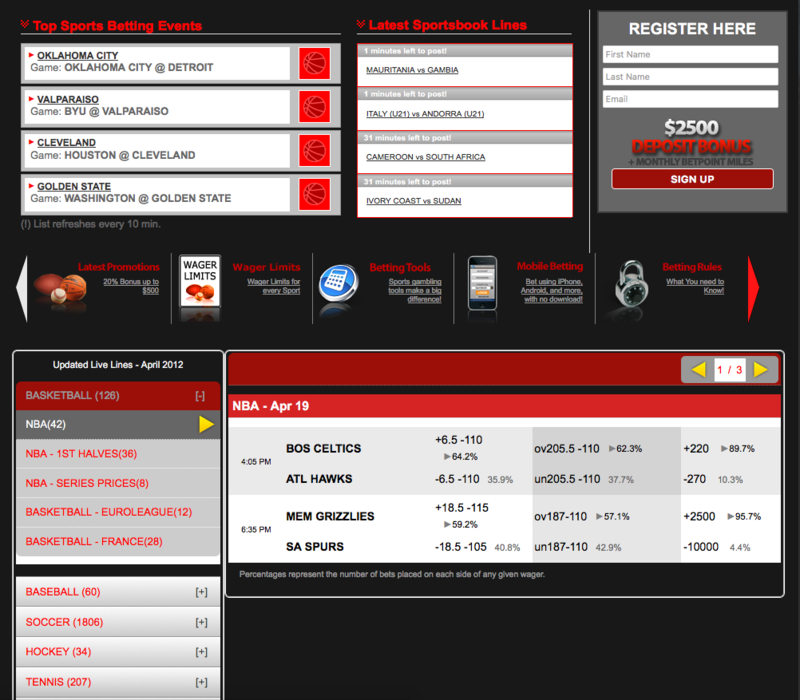 You’ll still find standard -110 to -150 moneyline pricing on major sports, with underdogs sitting between +110 and +175. As previously mentioned, JustBet does offer decent dime lines for MLB games, something a few books still don’t offer to this day (for reasons unbeknownst to me). As far as any unique pricing goes for any other types of bets, you’ll be hard pressed to find anything that jumps out at you. One thing that does stand out would probably be the amounts of horse races the site covers on a daily basis. With well over 100 tracks available, the amounts of horse races is pretty impressive. This is a big part of their business model and they definitely like to please their horse bettors. Players can earn up to 8% cash rebates that get paid back daily to their account for betting on the ponies. Betting limits vary from book to book, and with JustBet’s lines that sentiment is really no different. The site seems to shy away from taking huge individual bets on games, and you’ll get limited on your bets if you start hitting the book for too much, too fast. The site caters to both recreational and serious bettors, especially with some of their game caps hitting a pretty legitimate $50,000 on certain bet types. For most major sports, including NCAA games, props and futures bets are normally capped at $500 and $1,000, with overnight lines on “sides” capped anywhere from $5,000 to $10,000 per game. However, game day betting is increased exponentially for certain sports, such as NFL and NCAA Football games, with sides going maxing out at $20,000 to $50,000 per game. JustBet.cx has a decent amount of options available for players looking to deposit and withdrawal on the site. They of course offer the most traditional deposit methods, including Visa/MasterCard, Neteller and bank wires. They also offer bitcoin for deposits and withdrawals. If you ever run into any problems with account funding or just have a general question you can always talk to someone via Live Chat on the website itself, calling support at 877-750-1986 and/or emailing [email protected] 24 hours a day, 7 days a week. 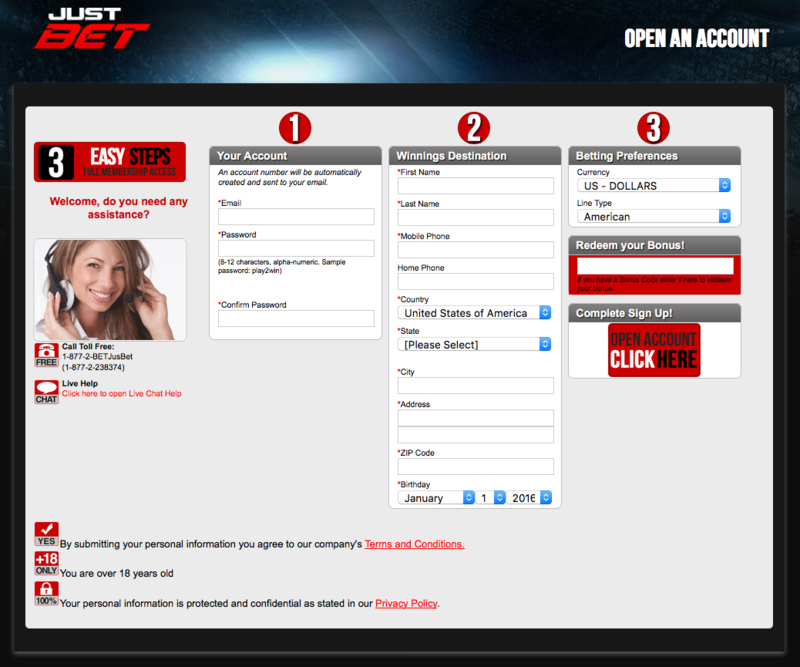 There are 11 deposit methods currently active at JustBet, with most major credit cards accepted here. Here’s a quick breakdown of the most popular ones, which I’ve broken down by USA and International bettors. 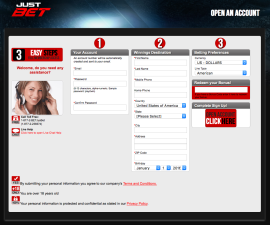 There are only 6 available methods for withdrawal at JustBet. Please check the list below for minimum and maximum withdrawal limits and timeframes. Neteller ($100 min, NO MAX): 2 to 3 business days to process fully, with $25 fees for all withdrawals up to $8,000. Bitcoin ($100 min, $50,000 max): processes almost instantly, limited to $3k withdrawals per week. ECO ($100 min, $1,000 max): processes in 2 to 3 business days, with one payout being issued per week. Bank Draft ($100 min, $3,000 max): processes in 7 business days, with one payout allowed per week. Money Orders ($100 min, $500 max): processes in 2 to 3 business days, with one payout allowed per week. $25 to $50 fees assessed depending on the amount withdrawn. Person to Person ($100 min, $500 max): 2 to 3 business days to process, with one request allowed per week. Like money orders, there are fees ranging from $25 to $50 per withdrawal. Like the desktop version of the site, the mobile version of JustBet.cx is easy to navigate around and functions exceptionally well with most smartphones and tablets. The site doesn’t have a standalone app just yet, however, there does seem to be plans for an Apple Store app that should be hitting the marketplace any day now. For the time being, if you have an iPhone, Android-powered device or even a BlackBerry, then you already have instant access to thousands of lines for both USA-friendly and international sports alike. 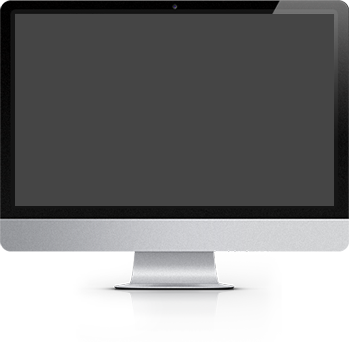 The site is 100% secure and encrypted so your account information is always safe.